Arapaho National Forest is a National Forest located in north-central Colorado, United States. The facility is managed jointly with the Roosevelt National Forest and the Pawnee National Grassland from the United States Forest Service office in Fort Collins, Colorado. 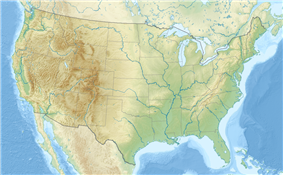 The combined facility of 1,730,603 acres (2,704.07 sq mi, or 7,420.35 km²) is denoted as ARP (Arapaho, Roosevelt, Pawnee) by the Forest Service. 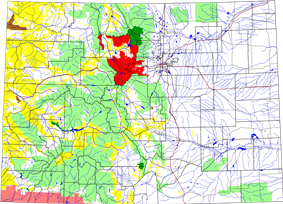 Separately, Arapaho National Forest consists of 723,744 acres (1,130.85 sq mi, or 2,928.89 km²). 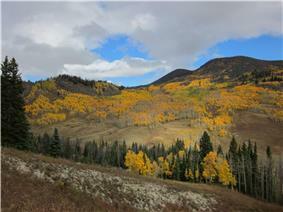 The forest is located in the Rocky Mountains, straddling the continental divide in the Front Range west of Denver. It was established on July 1, 1908 by President Theodore Roosevelt and named for the Arapaho tribe of Native Americans which previously inhabited the Colorado Eastern Plains. The forest includes part of the high Rockies and river valleys in the upper watershed of the Colorado River and South Platte River. The forest is largely in Grand and Clear Creek counties, but spills over into neighboring (in descending order of land area) Gilpin, Park, Routt, Jackson, and Jefferson counties. There are local ranger district offices located in Granby and Idaho Springs. There are six officially designated wilderness areas lying within Arapaho National Forest that are part of the National Wilderness Preservation System. Four of them are partially in neighboring National Forests, and one of these also onto National Park Service land (as indicated). Most of the movie Red Dawn is set in Arapaho National Forest.